The Art Of... African Drumming | The Art Of | Kids VT - small people, big ideas! When Chimie Bangoura moved to Vermont in 2007, he knew plenty of languages, but English was not one of them. Growing up in West Africa, he spoke French at school and learned the six native languages spoken in his home country of Guinea. 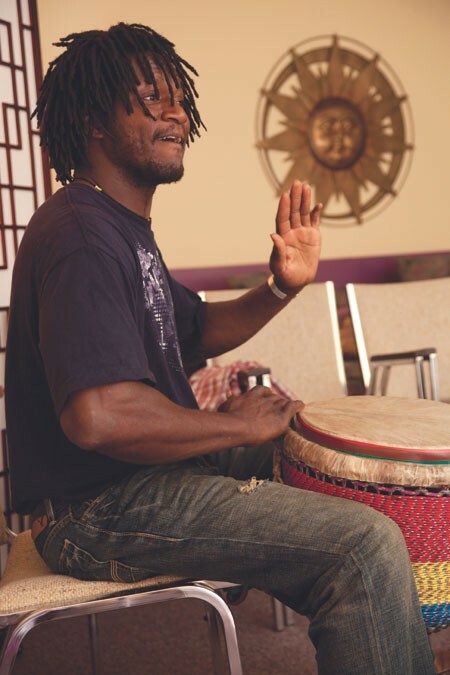 In the U.S., Bangoura teaches people to communicate in an entirely different way — with the African drum. He has found that patience, encouragement and a ready smile are more important components of his teaching method than an extensive vocabulary, though he has picked up some English over the last five years. He has taught children as young as 5 to play the hand drum, also called a djembe, imparting much of his homeland's culture and traditions in the process. "They love it," he says of his students. "They will play all day." For many kids, the urge to bang on a drum is irresistible. The djembe, with its hollowed-out wood base and goatskin-covered head, offers instant gratification, as River Rock School students discovered at a recent workshop in Montpelier. They took turns on the hand drum and stick drum, also known as a dundun. The djembe is held between the knees, tilted slightly forward so that a full sound can escape from the bottom. Three distinct sounds are possible: the slap, which is achieved by hitting the edge of the drum with fingers closed; the tum, which is similar but with open fingers; and the bass, which comes from hitting the center of the drum. Using those three sounds, Bangoura showed the class how the drum imitates language. Afterward, each student had a chance to make the instrument speak. Sabean Pia-Needleman, 13, caught on quickly. "You can make it sound like you're saying anything you want," she said. Some students started out tentatively but gamely followed the rhythm. Bangoura encouraged more assertive soloists to listen carefully to a rhythmic pattern and try to reproduce it. When everyone repeated the pattern in unison, Bangoura cried out, "That's a good sound!" By the end of the session, students carried the rhythm on hand and stick drums while their instructor led a smaller group in African dance steps — Bangoura in his bright, patchwork, traditional clothing; the River Rock students in shorts and T-shirts. "They were happy to dance," he said later. "Even little kids catch on to it." Celebrations in West Africa — vibrant, energetic affairs filled with dancing and music — always include a cadre of drummers telling stories with their instruments. "When you have a wedding, when you have a baby, you call drum people," said Bangoura. Bangoura brings his own West African djembe and dundun drums to his workshops. Those looking to buy their own djembe will find Vermont-made hand drums at Putney-based Everyone's Drumming. The company offers a variety of drums including kids mini-drums, which are 12 inches tall with a 6-inch head, for $50. The full line is available online, in the company's Putney showroom and at music stores in Rutland, Brattleboro and Hanover, N.H.
For private lessons or a workshop, call Bangoura at 377-9721.Info, everyonesdrumming.com, 800-326-0726.